Win A Moji Foot Massager and Give Your Tootsies some TLC! 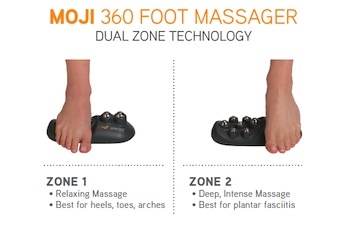 Give your feet a treat—enter to win a Moji Foot Massager ($39 value)! Two readers will win a Moji Foot Massager. Enter today and soon your tootsies will be thanking you. Moji was started in 2007 by a longtime competitive athlete, Victor Viner, who found out after decades of cycling, skiing and basketball, that he needed some help with warm up and recovery. Moji products aim to combine scientific principles and smart design to make effective product that are fun and easy to use. Moji’s product line includes massage products, cold compression and heat therapy products for recovery and injury prevention. 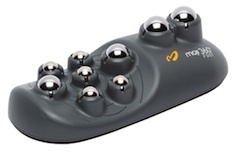 The Moji 360 Foot Massager, like all of their 360 massage line products, features solid steel massage spheres that rotate 360 decrees to massage in all directions. According to the product literature, the larger the sphere, the deeper the massage, the smaller the sphere, the more targeted the massage. Personally, I don’t like my feet being touched (yeah, I’m one of those people). However, that doesn’t mean my feet don’t ache, so the Moji 360 Foot Massager was a great product for me to try out. I liked to use with while wearing socks because I didn’t like the feel of the cold steel spheres on my feet, though in the heat of summer that would probably feel awesome. Plus with socks, I found that my feet slipped more smoothly over the spheres. I loved the smaller spheres for my arches and toes, but found the larger spheres too intense for me. Apparently the larger spheres are good for plantar faciitis—something I do not have, so maybe that’s why it felt like too much. In any case, the base was slip-resistent and it couldn’t be easier to use—just put it down and roll a foot over the top. There are no batteries to wear out and nothing to fall apart or pop off, which I liked. I even picked it up and used it on my legs after a particularly brutal session with my trainer (jumping lunges are my new most hated exercise). The Moji 360 Foot Massager is manufactured in the midwest, and retails for $39 at specialty athletic stores. To find a retailer near you go to their website (you can also see their other products there, as well as some of their videos). OR, you can enter to win one of two foot massagers we have to share with our readers! 2. Then leave us a comment below telling us why you need a Moji Foot Massager! This contest is open to residents of the continental US please. All AFH terms and conditions apply. My husband won’t massage my feet. I need something to do it for me. I would like to win a Moji on, Im a amputtee and my one foot gets to hurting bad!! I have plantar fasciitis – and it gets bad first thing in the morning. I end up compensating on the foot that doesn’t bother me as much. I have tried insoles and doctor visits but its just one of those things that will never really go away. One of the ways to work the inflammation out is to massage the area (a ball) etc. However, I think that having one of these would really help! Hoping that I am one of the lucky ones that gets utilize this product. Thanks for the giveaway! I work 12 hour shifts at my job, with 90% of that time standing/walking on concrete. It is a real killer on the feet. I started running and my feet ache afterward. I need a foot massager because I don’t want to rub my husbands feet. I wear 4″ heals all day long at work and then come home to a 2 year old! Because winning this foot massager would allow my husband to have a break from ruby my feet! To soothe my feet after my lengthy walks in the foothills and to have the strength to cook for my family. The golf balls I use now to massage my feet roll away from me. A moji would be perfect! I really believe the foot reflexology stuff works but don’t take the time to do it and this would help do it for me! My husband is on his feet all day and this would be great treat for him everyday after work!! Oh gosh, mostly because I am a firm believer on the soles of feet and palms of hands as having the points of our entire body, but also because a good foot massage can do wonders to calm me down, reduce stress after a busy day, and even calm down a bad headache! i’m on my feet all day – would love this! I can’t get my husband to massage my feet every night so I need to replace him with a machine. I stand on my feet all day, this would feel great at the end of the day. I want to win one for all the reasons other people want to win one. But also quite simply I can not afford to purchase one of these as I am not working and am unable to work standing due to you guessed it, major feet issues. I am hoping one day this will change and maybe this will get me there. Oh and what is the mini Moji? My tootsies would love me! To relax at the end of the day. Getting your feet massaged feels so good and does the whole body good! I need this massager to relax my feet. This massager would be great for my feet after a day of being on my feet. My husband works retail and he’s on his feet all day so he could really use this! Walking around on these size 15’s all day just leaves them achy!! I need this so bad! I’m training to run my first 5k and these dogs aren’t just barking, they are HOWLING! What a fun prize! this is great for those working on their feet all day! It would make for Happier feet. This would be great for my constantly sore feet from A.S.
this would be so good for my feet !!! I am just starting to train for my second marathon. Would love to have my feet pampered after long runs!! My feet would be forever thankful! I have MS and my main symptom is extremely painful feet. It’s next to impossible to get around some days. Thanks for considering! I have the most painful feet! I need this to relax after my long workweek! I would love to win one for my daughter who is flat footed and was in so much pain from walking last year, that she had to get special made insoles. I’m currently training for my first Ultra-Marathon, the JFK 50, and with the amount of miles I have been putting in this foot massager would really come in handy. Sometimes my feet just ache all over and putting them on ice gets old quick especially with the outside temperature dropping. I’d relish the opportunity to give this product a whirl and hopefully be able to pass on its success to my fellow running club members. I NEED a Moji because I am on my feet all day training clients and training/running my puppies. My feet would love some sweet relief thanks to the Moji Foot Massager and AFH:) Thanks for the chance ladies~ this is awesome!!! I would love to win this as I have been a competitive runner for 8 years and needless to say my feet are always sore! I also have a job where I am on my feet all day. I’d love to use this to ease my tired, achy feet! Oh, my feet would feel so kissed with this wonderful foot massager. After having back surgery to relieve pressure on a nerve causing me to have a drop foot I am left with partial numbness on one foot (big toe & inside arch). I am thinking that this massager would help with the circulation and maybe ease the tingling that I get. Boy oh boy, I would be in heaven if this magic machine would give my poor footsie a treat! When I was young my mom always rubbed our feet when we were sick or had some pains. She knew all the pressure points. Couldn’t always take it then but now would love to have this foot massager to help relax my feet and body. My feet swell daily. It would be great to keep the circulation moving. Between my calluses and working out/running, my feet really hurt sometimes. Having a massager would be great. Oh, just looking at this Moji Massager makes my feet feel better! I have recurring plantar fascitis as well as arthritis in my feet, which isn’t a great combination with a job that keeps me on my feet all day. At age 61 and living alone, a massager would be a dream come true. im signed up for your newsletter. I would love a chance to relax through my feet. Oh please pick me. My husband works 6 days a week on his feet all day. This would be great to recharge his feet for the next day. Please pick me! Because a good foot massage makes the whole body feel better! I need this so bad Im a waitress and mom with three boys at home and my feet always hurt! I had surgery on my left foot 3 yrs ago and it’s never been the same! I need one! I need this for ZONE 2!!! I really need this foot massager because I am also one of those people who don’t like their feet being touched by others, plus, I also have flat feet that tend to get very achy as the day goes on and especially when I run. I am a diabetic and stand on my feet all day. I would love a foot massager for my feet!! Yes yes yes! I need this. After I run, sometimes the balls of my feet begin to get sore. I need Moji to release my feet and make them feel fresh. I shared this giveaway on twitter. Extra credit? I need a Moji Foot Massager because this would really help me relax after a day of being stressed out. This would be wonderful for my feet. They get so sore and tired and this would be easy to use. To soothe my feet after running! This looks like it would relieve some of my plantar fasciitis pain! Nicole S and Rosemary E.
You’ll get an email from us to claim your prize. I would be great after a long day at work. Wish I’d found this contest a couple weeks ago…I’ve been wanting to try one of these! Oh well…maybe next time.